Now that we're well into July, the seemingly eternal kids' question 'I'm bored, what can I do?' seems to be gaining momentum. Here are 5 surefire ways to keep them occupied - at least for a little while! They're the traditional to-do's, tried and true. The weather's beautiful. You grab your hats, water bottles, insect repellent and head out for a walk in the great outdoors. Fifteen, maybe twenty minutes into it - depending on their ages - up pops the 'I'm tired/I'm bored of walking' comments. The Naturebag Eco-Activity Kit is a great little bag to take along on any outdoor adventure. It's packed with loads of great activities to keep the kids engaged and includes a step-by-step guide for parents to lead them. It was created by two mompreneurs (one a former educator) with the aim of getting kids outside and exploring nature rather than watching tv/playing video games/sitting in front of the internet. It's received a glowing endorsement from artist and naturalist, Robert Bateman. Find out if your local library has a summer reading club and join! Every library - at least in BC - is offering a summer reading club for kids, Summer Reading Club 2009 - Follow the Reader. For preschoolers, there's the Read-to-Me program where a record of books the preschooler shares is kept on a special card. You can drop in to the library for weekly stickers, stamps and reading suggestions. For beginning readers to those in Grade 7, there's the Summer Reading club where members are given a special registration package that includes a Reading Record. Kids are encouraged to report their readings, watch for special weekly programs and prizes. In September, certificates and medals are awarded. It may take longer and it will definitely end up being messier, but baking with kids is a great way to engage them and you'll have something yummy to show for it - usually. Try banana bread, sugar cookies, in season blueberry/raspberry muffins, cupcakes (can't get enough of those sprinkles) or granola bars. Sugar cookies are one of the most time consuming but - similar to playdough - kids love rolling the dough and cutting out the shapes, then either putting on sprinkles prior to baking or icing them once they're baked. The more unusual the cutter shapes the better. 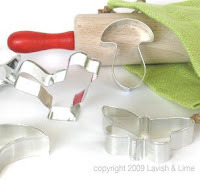 This is a great set of natural cutter shapes - featuring a moon, butterfly, fish, toadstool and bird - or go for a gift set that includes a lovely wooden rolling pin too. Arts and crafts are always a hit and usually the messier, the more fun. Try modelling clay that simply requires a few days to air dry, then the kids can paint it or older ones can chisel/shape it as they wish. 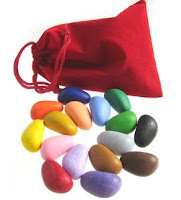 Soy-based, pebble-shaped crayon rocks are great for developing the tripod grip that prepares children for writing, as are triangular coloured pencil crayons. Why not give them their own special sketchbook for Summer 2009 so they can create what essentially becomes a visual diary. Check out these super funky, recycled kids sketch books that are made in Canada. Don't forget face painting - a true source of hours of fun. We've found some great non-toxic, wooden face paint pencils from Germany that don't require any water and they wash off easily, but not so easily that they disappear within minutes of being drawn on. And you can always focus on 'tatooing' hands and arms too! Here's the text for the sticker club chain letter, it's a good one to catch their interest because pretty much all kids love stickers! Welcome to the sticker club! Please send one packet of stickers to the person listed as Number 1. Move my name to the first spot and place your name in the second spot. Then send this letter to 6 of your friends. If you cannot do this within 6 days, please let my mom know because it is not fair to those who participated. Within 2 weeks, you should receive 36 packets of stickers! It is lots of fun to see where all the stickers came from…and also nice to get some mail. Good luck and thank you for joining the sticker club! 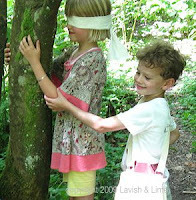 For more ideas about keeping kids busy, visit Lavish & Lime. Do you have ideas, thoughts or comments about keeping kids busy? Please add them below! Everyone who leaves a comment before July 31st will be entered to win a sport size all natural sunscreen from Soleo Organics.